PASADENA -- It's been a long pull since the first-ever Television Critics Association awards in June 1985. It's also disconcerting to see that now prehistoric-looking black-and-white photo of five past presidents and inaugural Career Achievement honoree Grant Tinker, who then was chairman of NBC. Particularly because I was the only one in attendance at Saturday night's milestone 25th annual Television Critics Association awards ceremony. The others in the picture are either deceased, no longer employed at their newspapers, or in the case of my longtime friend, Tom Jicha, unable to attend because his Tribune-owned Florida newspaper couldn't/wouldn't spend the money to send him. So the night's history lesson fell to me and my slim, shadow budget at unclebarky.com. In short, I paid my own way, and the money was very well-spent. Most of my fellow TV critics are still out on "press tour," where one network after another will roll in with a lot of oddly instructive B.S. about new fall programming until Saturday's last dance with ABC. 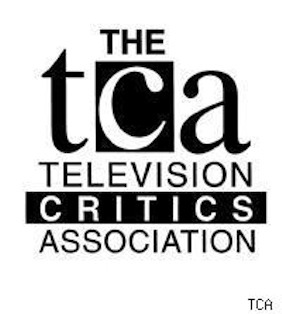 The TCA awards provide a pause to dress up and honor the shows we really appreciate. But since this was the 25th occasion, a little time travel also seemed appropriate. 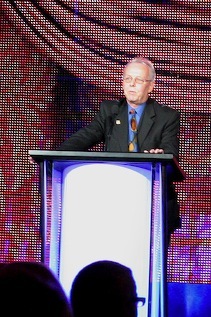 After all, hardly anyone in the audience knew that the plaque being held by Tinker was made at Trophy World in Phoenix. Or that he was our only invited honoree because the organization was very worried about being too close to the industry we covered. That's all changed. Saturday night's guests included stars from Mad Men, True Blood, The Big Bang Theory and Battlestar Galactica. Noah Wyle also attended to accept a "Heritage Award" for ER. And Betty White appeared very much alive and in person to receive the Career Achievement award. "The art of television criticism -- and we like to think of it as that -- seems to be something of an endangered species. Reviewers of other performing arts are also being deemed expendable. "Know this, though. Television, whether you're watching it in an old-school living room or on a state-of-the-art website, remains by far the most popular of all our entertainment mediums. Great stuff is still being done -- and attention should be paid to it. That's why we're all so happy -- and privileged -- to be here tonight. There are a good number of TCA newcomers in the audience, too. So in new ways, in different forms, this beat goes on. "I've covered TV for 30 damned years now, and can still get excited about it. However much longer it lasts for me, I can always fall back on the closing words of Robert Duvall in Lonesome Dove. "It's been quite a party," he said. And in every good sense of the word, it most definitely has." By the way, the TCA had the good sense to name Lonesome Dove our 1989 Program of the Year. It also was cited for "Outstanding Achievement in Drama." At that year's subsequent Emmy Awards, Dove won a lone trophy -- for sound editing.